And replaces hope with skepticism. That is why the young should not read the poetry of the old. If you just believe them hard and long enough. Dreams do of course sometimes come true. Dreams that achieved can taste like dust or leave others in the dust. Dignity and freedom from want and despair. Throughout history the rich have always oppressed the poor. And the poor fight back with nothing left to lose. An old man like me has no advice for the struggling young. 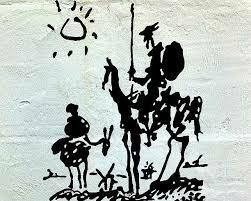 Riding on an old nag, broken lance in hand, to tilt at windmills. Because he tells them a secret that restores their hope. Its power is only the false belief that it is there. The rich and powerful claim only they can read. In the guise of a fool, his fantasies still intact. In the name of love and justice. Ready and willing to tilt at windmills, your fantasies still intact.